Today is the 1418th day the Saudi blogger Raif Badawi has spent in prison. Last night, the International Publishers Association awarded him its Prix Voltaire, and his powerhouse wife, Ensaf Haidar, traveled to London to accept the award on his behalf. 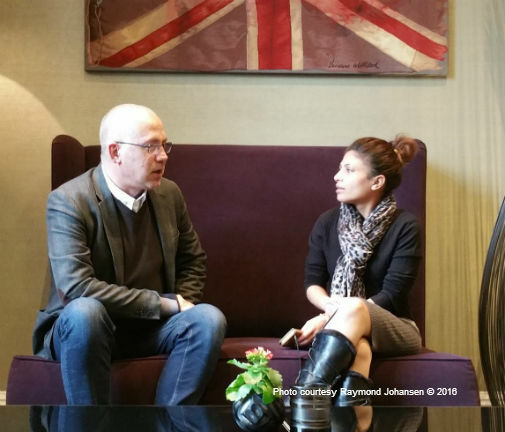 Raymond Johansen and Ensaf Haidar, from his Facebook page. After he was arrested in June 2012, after a long trial, Rai Badawi was found guilty of having ideas that his country does not favor, even finds to be a threat. The authorities declared that his self-published essays “propagate liberal thought,” and the search for a punishment that it deemed proper took over a year to calculate. He spent that year in prison. Badawi’s writings include statements like this: “States which are based on religion confine their people in the circle of faith and fear,” so the Saudi Arabian judicial system decided to live up to that observation and decided that a public flogging was the punishment it deemed proper. One thousand lashes and ten years in jail. On January 9, 2015, the first 50 lashes were delivered. Today is no more nor less special in this nightmarish story; it is one more check mark on a calendar. Day 1418 in prison passes into night 1419. All for writing. Last night, Ensaf accepted one more well-deserved prize. The international movement on his behalf, sparked by a young wife’s determination to make the world know her imprisoned husband’s name, led Amnesty International to declare months ago that it has received more signatures for petitions demanding his release than any other in its long and remarkable history. On his Facebook page today, Johansen wrote, “We have been working very hard to get Raif a pardon these last few years and it was an absolute pleasure to meet Ensaf. Her French is better than mine, but we agree on certain activities in the near future focused on one single goal: Getting Raif out of prison.